Janice H2O Color: Ahead of Schedule for the SCVWS Annual Show! Some paintings far surpass my expectations and some are scary awful, but it's always fun. Ahead of Schedule for the SCVWS Annual Show! Since I'll be traveling in September, I've been scrambling to get ready for 2 upcoming shows. The SCVWS Annual Members show begins on September 30th at the Rose Shenson Gallery at the Triton Museum in Santa Clara. Please come to our opening reception that day from 1:00-3:00 p.m. if you're in the area. This is the painting I'm submitting for the show-there was no theme this year so anything goes! 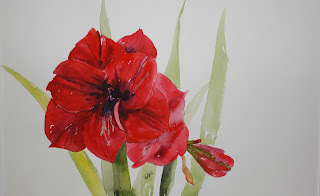 I've painted this beautiful red amaryllis 3 times and I think this one is the best of them. . Even though it's pretty loose, when I reduced it to make some note cards, it looked almost photo-real. In addition, I'm framing a number of pieces for a 4 artist show at the Institute for the Study of Western Civilization in Cupertino, CA. My paintings are a group I've titled "Italy and More." Most of them are of...you guessed it-Italy! But there are a few other subjects represented from other travel and a couple of still lifes that fit into the theme (figs and lemons, which are both pretty commonplace in Italy﻿.) I'll give more info about this show at a later date. Thank you, the article is very petrifying, hopefully it can be useful for everyone.